Have you ever read those stories promising to tell you all you need to know about yourself, based on something completely random, like, what’s in your left pocket at that particular moment, or what ice cream you had last week? I certainly do! Aren’t the findings always totally arbitrary, and frequently infuriating? Yay, random generalizations! So let’s pass judgment, even though we know absolutely nothing about each other! 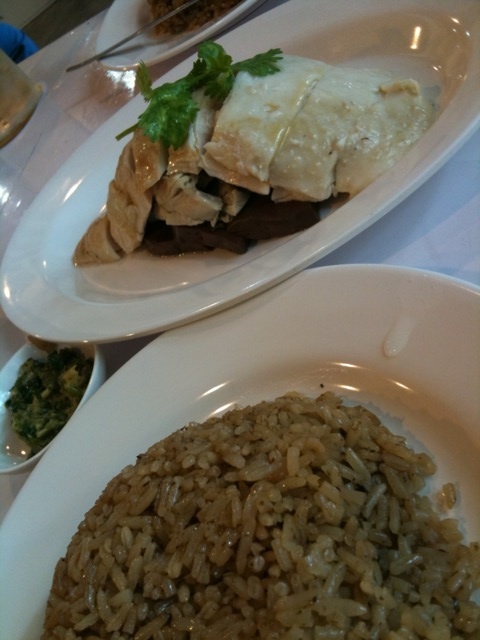 Where do you like to eat your Hainanese chicken rice? You like tradition, and stability, and saying you know more than anyone else. You like big portions, and creature comforts, and stuffing your face. You are kind of boring and your friends are only pretending to listen to what you say. You also really like good chicken rice. 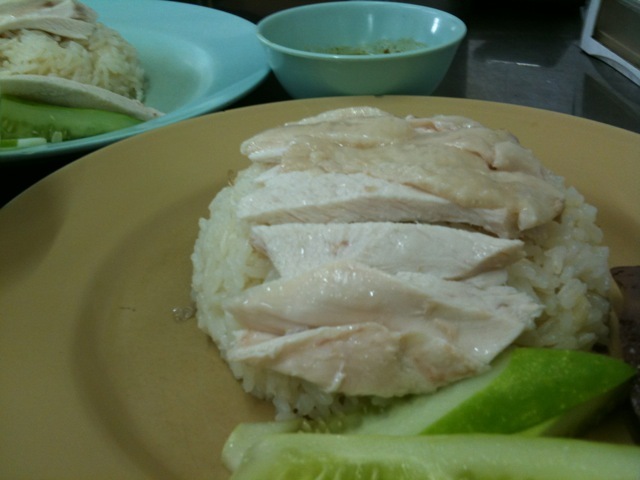 For the record, this is my favoritest chicken rice, EVAH, still, after all these years. I like this chicken rice almost as much as I, like, commas. What makes it isn’t really the big tranche of plump, tender chicken meat (dark meat or breast), topped (or not) with a sliver of skin, nestled next to two slices of congealed chicken blood and resting atop sliced tomato and cucumbers. It’s not even really the rice, glistening with chicken fat. It’s the sauce. People who really like sauce will LOVE this dish, which comes with not one, not two, but FOUR sauces: sweet thick, slivered ginger, brown bean/garlic, and soy sauce/chili. Yum! You are straightforward and like simplicity and honesty. You dislike and mistrust frou-frou, complications and anything overly ornate. This means you are a little bit like a hobbit, or other magical little creature that people idealize without actually envying. 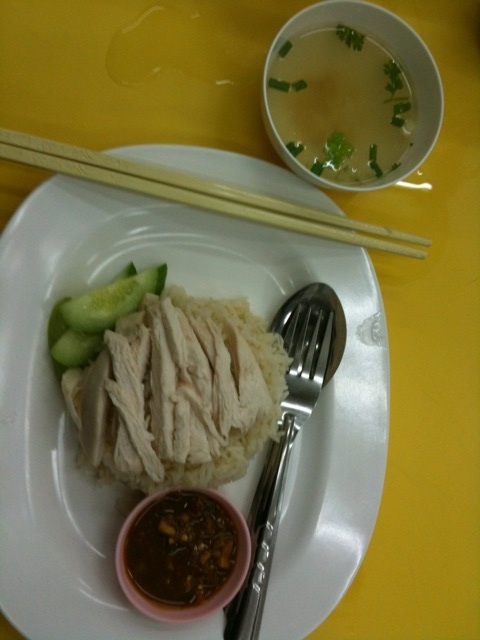 I like the chicken rice here because it is about pure chicken flavor. 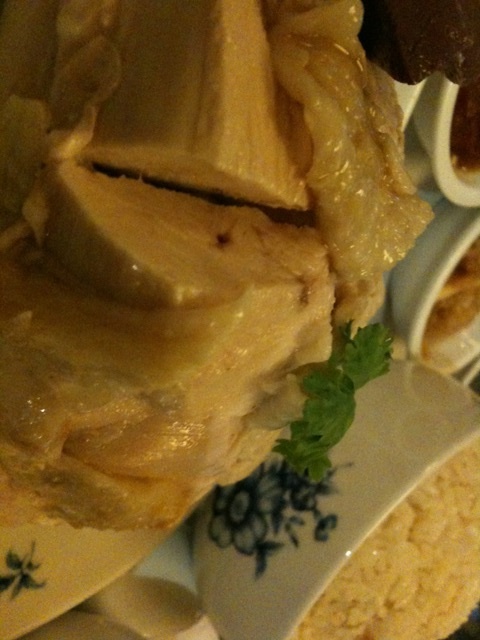 The boiled chicken is presented simply, shredded and without skin, on top of rice carefully cooked in chicken stock and set off by slivered cucumbers for texture. The sauce and soup are almost like afterthoughts. This dish is about substance, not bells and whistles. It’s almost … wholesome (for a dish where chicken fat plays a starring role). You like nostalgia, reminiscing over your plate of food with dusk threatening, headlights sliding past you as you contemplate next week’s work project. You are social and trusting and tend to believe the best in people. Also, you are sort of old. Random enough for you? Honestly, this place is pretty good, even if I don’t get to it as often as I could. I would totally have included it in my book … if not for the, uh, 50 other food stalls that I put in it. So there’s that. They are proud of their dish and take care in selecting and presenting the best chicken (non-egg-laying female chickens, to be precise) that they can. The soup has good flavor and service is efficient. It has all these things going for it. They don’t need little old me anyway. We can still live together in harmony. You yearn for adventure, newness and surprising others. You hate convention and conformity, and like to be onto the Next Big Thing before anyone else. However, your tendency to tell people about the Next Big Thing helps to undermine you, and can sometimes threaten to make you look like an asshat. You are probably a food blogger. Because this place is open 24 hours, you are also probably a bit of a night owl. Nighttime is good for you, because this place is a lot less crowded when it’s not serving lunch. You have your choice of steamed or fried chicken, rice with Chinese seaweed, or “Shanghai chicken rice” with a dipping sauce liberally flavored with chili oil. For you, variety is good, and the possibilities are endless. Haha, yes! Join this sad old club of ours! Hope you like it as much as I do. I will have to go there before I figure out what this place says about you. This piece is so good–I wish I’d written it and am glad you did. Any reviews / insights on eating places in Pattaya? Would love to read & try your suggestions. Hmmm. I don’t go to pattaya frequently enough, but am a fan of Nong Aey — especially their sator with shrimp. ‘Nong Aey” Where is that? Love to try it, if you say it’s good! I go to Pattaya twice-a-year. Was there last month. Loved “J.Daeng”. Fantastic food. Quite autentic Thai, as well. Located opp. 2nd.road entrance of Siam BayView Hotel. Do keep me posted, as and when you sample/hear about good, authentic Thai food places in Pattaya. Clever way to review multiple places. I, too, suffer from a love of commas. Chicken rice, too. I tried to comment on your blog, Christao, and found it complicated. Computers, they confuse and baffle me! I’ve been thinking about that place. Pickled lime in the soup, right?